January is one of my favorite months. 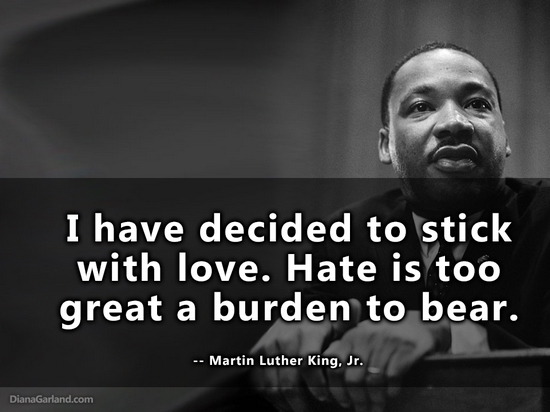 I always relish honoring Dr. King and all those who have boldly and sacrificially fought with truth and peace for equity* (see footnote for more on equity) for all people and continue to. In our home we always seek to celebrate MLK Day with some type of reading/reflecting/commemoration/dreaming. We sometimes listen to/watch the “I Have a Dream” Speech, or watch a racial justice focused film. If you haven’t watched President Obama’s Farewell Speech, it would be a good pick. And we always make an “integrated” birthday dessert- usually some combination of chocolate and vanilla. Here are a couple of our past celebrations. 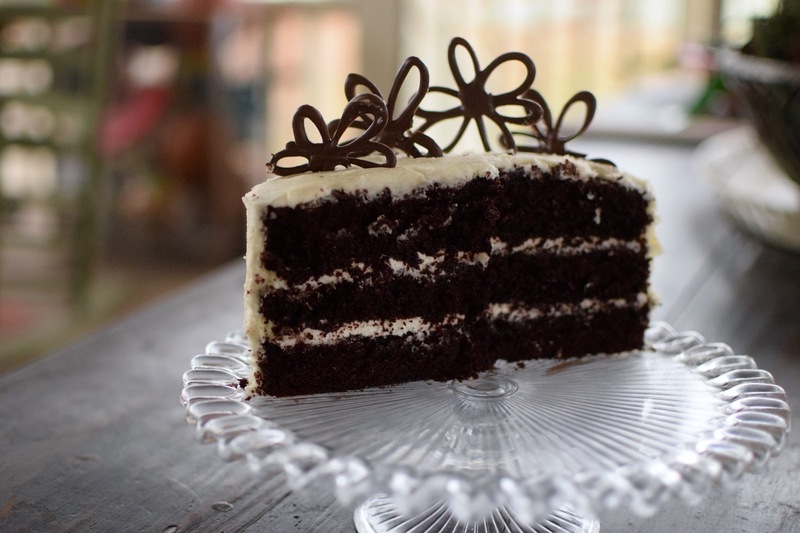 Her recipe is topped with a whipped mocha frosting that is silky and delicious. 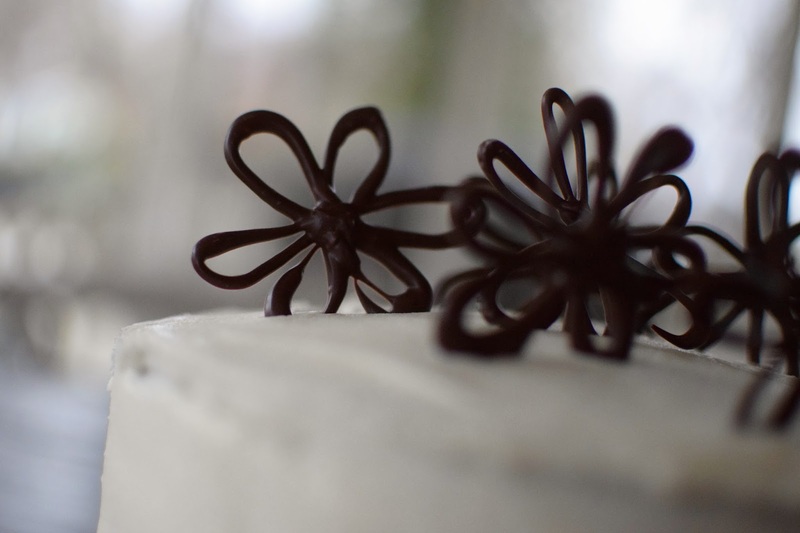 I decided for the MLK cake to top it with vanilla almond buttercream frosting instead so that it was white and black. [I made it with butter and coconut oil.] If you use Refined Coconut Oil (like the Crisco brand Coconut Oil) it doesn’t taste coconut-y. And the fun part was making these toppers. 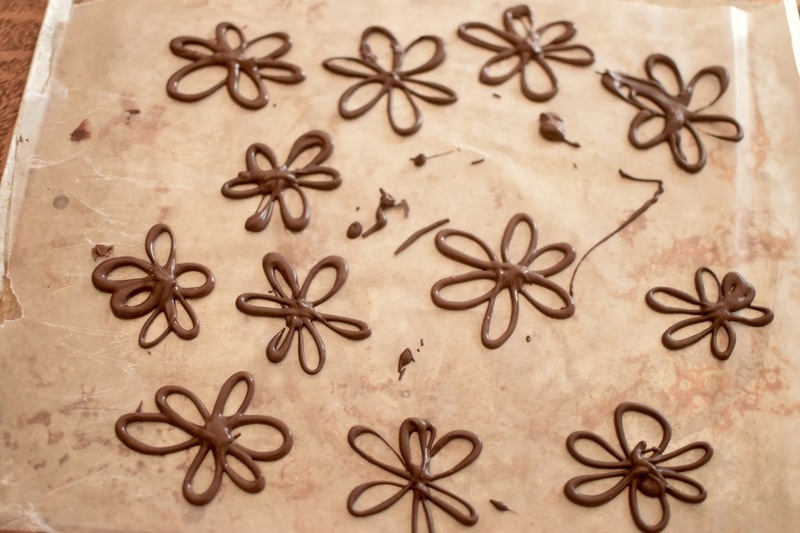 The inspiration for the chocolate flower toppers was from The Great British Baking Show. They made these on an episode and my girls and I were enamored. They look so impressive to be so simple to make! You really should try making them. I haven’t tried other shapes but you could really have some fun with this! makes more than enough, but better too much than not enough! Add the flour, sugar, cocoa, baking soda, baking powder, and salt into the bowl of an electric mixer fitted with a paddle attachment and mix on low speed until combined. In another bowl, combine the buttermilk, oil, eggs, and vanilla. Beat butter and salt at medium speed with an electric mixer 1 to 2 minutes or until creamy. Gradually add powdered sugar alternately with spoons of milk, beating at low speed until blended and smooth after each addition. Stir in extract. Add milk or powdered sugar to arrive at desired thickness and texture. 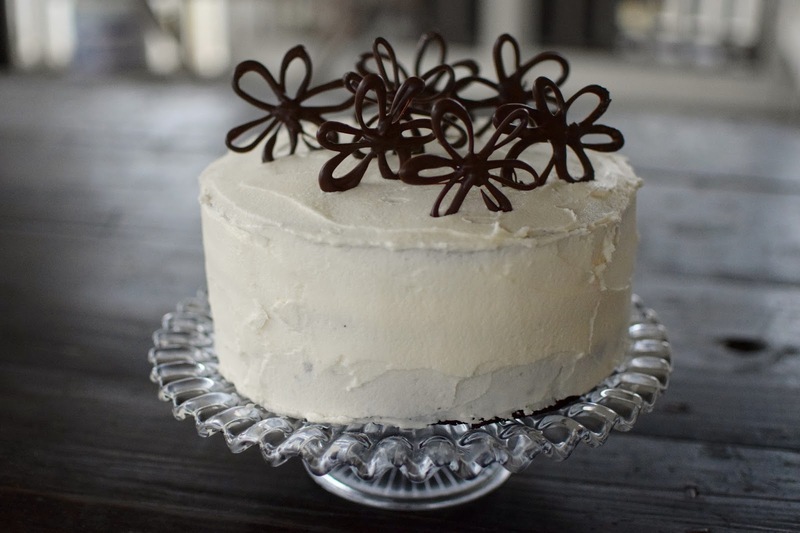 With a knife or offset spatula, spread the top with frosting. 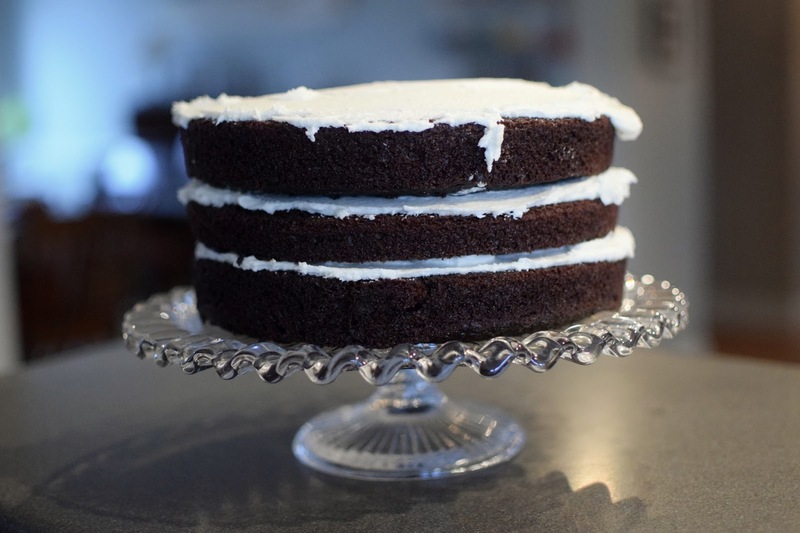 Place the second layer on top, rounded side up, (if you made a third layer, repeat,) then spread the frosting evenly on the top and sides of the cake. Melt a small amount of dipping chocolate (I like Ghirardelli the best) following instructions on the package for melting. Melt and stir to where it is smooth but not too runny. using a spatula, spoon it into a plastic zip-top bag. Lay a piece of waxed paper on the counter. Use scissors to clip a very small bottom corner off of the bag. Quickly and gently let it pour in a looping formation. You may have to try it a few times to get the hang of it. I like to do a loop and then continue across from it and then start a new loop across from that, and so on, making 6 loops total, crossing in the middle to give it strength. You can also draw on a piece of paper the design you want and place that under the waxed paper as a guide. Once they solidify, transfer the wax paper to the refrigerator. Hoping you are having a great start to the new year and that you have a peaceful and meaningful (and delicious) MLK weekend. *footnote: Equity and equality are related but distinct terms. One day in class, I was speaking about equity and a student asked, “Do you mean equality? 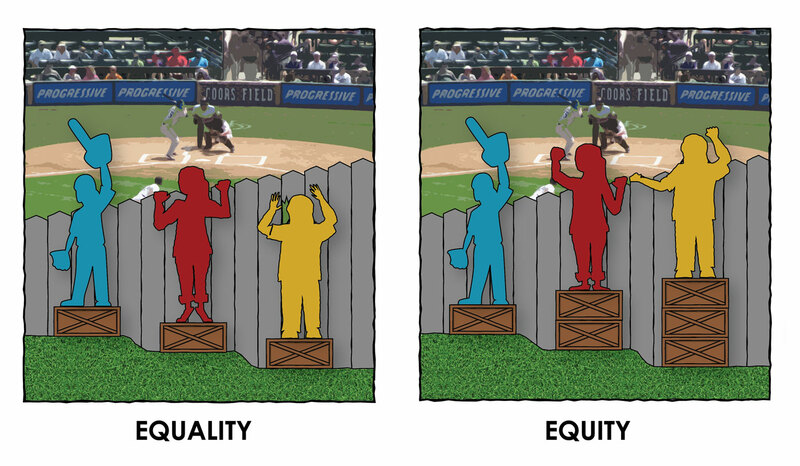 Is that the same?” I said, “Well, equality is when people are given the equal amount of something or equal treatment, but equity goes beyond that and seeks to level the playing field- thus making people at a common level, or equal place. This requires more for some than others!” This graphic is the one I think most simply communicates this.